A Broward Sheriff's Office deputy was part of the massive contingent of law officers deployed to Marjory Stoneman Douglas High School in Parkland on Feb. 14 during the shooting. Some police and educators are facing consequences for the flawed response. 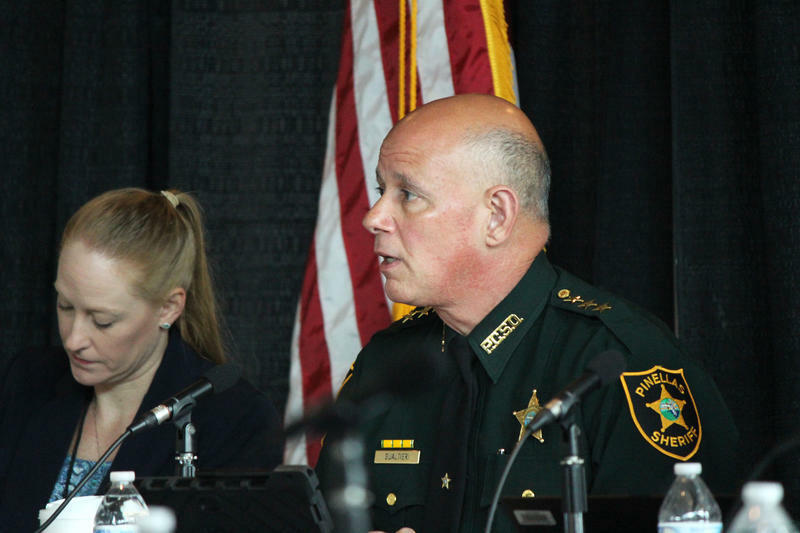 More people could still lose their jobs or face other consequences as a result of their actions before, during and after the Feb. 14 shooting at a Parkland high school, according to the sheriff who chairs a state commission investigating what went wrong. The Marjory Stoneman Douglas High School Public Safety Commission is preparing to release a report to the governor and Legislature by Jan. 1, and it's likely to include more detail about mistakes made by individuals leading up to the shooting that left 17 people dead, as well as during the slow, chaotic response. 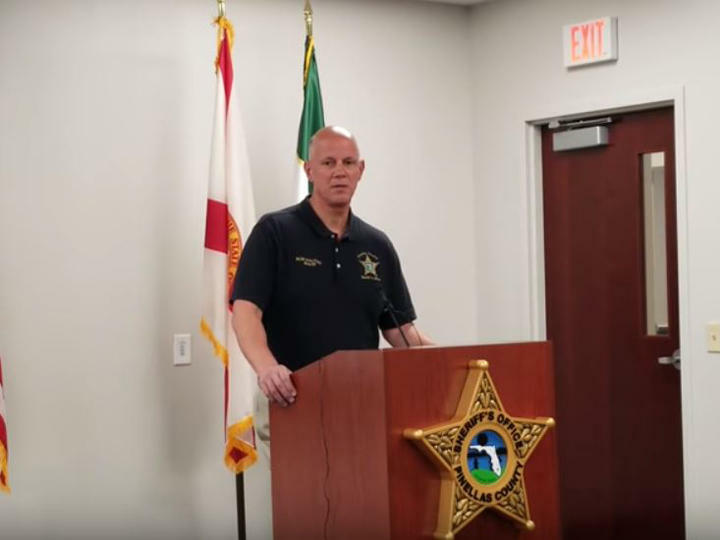 Pinellas County Sheriff Bob Gualtieri, who chairs the commission, said he has provided evidence to local leaders so they could make personnel decisions — and he said there's more to report. Broward County schools superintendent Robert Runcie and Sheriff Scott Israel will soon receive new information from the commission so they can "conduct the appropriate internal review" about other employees, Gualtieri said. "There are additional people whose actions need to be reviewed," he told WLRN. "At the end of the day, it's also important that each of those people be treated fairly, which means they have an opportunity to respond to specific allegations." Teachers and students at Stoneman Douglas protested Runcie's recent decision to reassign three assistant principals and a security specialist to other administrative positions in the district. The school district did not specify why each person was moved, but the transfers are a result of information uncovered in the state investigation. Also, the Broward Sheriff's Office captain in charge of the response on Feb. 14 has resigned, and two other officers have been placed on restricted duty pending an internal investigation. When asked whether the evidence shows Runcie or Israel themselves should be held responsible for mistakes, Gualtieri said: "I think that's best addressed in greater detail when the commission issues its report." He added: "There's a lot of things that were done right. There's a lot of things that were done wrong." Also, Gualtieri has said he now believes some teachers should be trained and armed, if they're willing and qualified. Listen here to the conversation between WLRN's Jessica Bakeman and Pinellas County sheriff Bob Gualtieri. Pinellas County sheriff Bob Gualtieri chairs the Marjory Stoneman Douglas High School Public Safety Commission. WLRN: You're the chair of the Marjory Stoneman Douglas High School Public Safety Commission, which is nearly finished with its primary job: making recommendations to the Florida Legislature about policy changes that could prevent another tragedy. You recently said the evidence you've uncovered convinces you some teachers should be trained and armed. Can you explain why? BOB GUALTIERI: These incidents happen extremely fast. They're over with very fast. And they're predominantly done by people with access to the campuses. So you have to have multiple layers there. And one cop, two cops is not enough to ensure that somebody can respond quickly, timely, and protect the kids and protect the others that are on campus. So we have to keep an open mind and certainly have a discussion — and probably a robust discussion — about expanding the scope of who is allowed. And this is not I can't stress that strongly enough: This is not a suggestion that we just run out and "arm teachers." It would be people who are well qualified, well-trained, who volunteer, who meet rigorous selection and rigorous training standards. And so the notion that we just give a gun to everybody is erroneous and probably being perpetuated by those who just have a philosophical opposition to the concept of guns. What was your position on arming some teachers before you began leading the state's investigation into the Parkland shooting? Prior to this, and back in February after this first happened, my initial thought was it probably should be cops. Because cops are those who are best trained and have the best equipment and have the resources. But once you get into it, and you find out what happened there at Stoneman Douglas, and you look at the active assailant incidents over the last 20 years, it brings you to the realization that that's not going to work. Because schools are no different than the rest of our society in that cops can't be everywhere all the time. These incidents happen so fast that you're never going to have enough cops in order to ensure that a swift action can be taken to preserve life. And on top of that there's not enough cops to go around. I know from a recent survey that we did, there's minimum today of 1.000 police officer openings in the state of Florida. Of the 4,000 schools in the state of Florida, there's cops in only about half of those. So where are we going to get 3,000 cops from? It's not realistic. So we have to realize that the the notion and the desire of putting enough cops in every school in Florida to eliminate the need for anyone else is an unrealistic expectation. Within weeks after the shooting, the Legislature passed a law creating the Guardian program, which allows some school staff to be armed. Do you think that's not enough? No, I think it should probably go a little bit further. The Guardian program allows anybody other than those who are predominantly classroom teachers [to volunteer to be trained and armed]. I think there are those who are predominantly classroom teachers that could be good candidates for this, because they have a desire, they have a willingness, they meet and would meet the rigorous selection standards, [they're] willing to go through a rigorous training, and they would be in a position to protect themselves and their students. Also, in the districts that are not allowing the staff to take advantage of the Guardian program — they need to rethink it. Some people who don’t like the idea of arming teachers say it's a ploy from the gun lobby to sell more guns. How would you respond to that? Well, I don't think that's true at all. That's certainly not where I'm coming from with it. What I would say to them is: don't let your ideological opposition get in the way of a reasonable discussion and reasonable consideration of what the facts show is a reasonable response. Another concern about putting more guns in schools comes from some black leaders who say it could endanger students, particularly minority children. They worry in part because of the incidents in recent years where young men of color have been killed by police. How would you suggest making sure that students don't become victims of gun violence because their teachers are armed? I don't even know where to begin with that. I'm not going to address that. I don't think that merits discussion. There's no basis for that. So I'm not going to even entertain that type of a question. There have been situations around the country where a teacher accidentally shot a student, where someone who was an armed guard accidentally left their gun in the bathroom. So certainly these problems sometimes come about. I mean, do you think it's not a legitimate concern that there being guns in schools could mean that kids get shot with them — even if it's their teachers or staff members who have the guns? You know, we have deputies that do that. There's cops that do that. So that's true. But people are imperfect. There is no perfect, but I can tell you what is absolutely imperfect: kids who are hurt and people who are hurt and/or killed where they can't defend themselves. And they could have defended themselves and stopped the carnage. There's no greater parade of horribles than dead kids as a result of an active shooter. People say — and this is erroneous — we need to do everything we can to prevent it. You're not going to prevent it. It's going to happen again. The question is where and when. And the overriding question should be: what have we done to effectively mitigate the impact of it? Because it is going to happen, and we better be in a position to nip it as quickly as we can. Any amount of injuries or deaths is too much. One is too many. But one is better than 30. Pinellas County was one of the school districts that decided to hire armed "Guardians." Your office has been involved in training them. How's that going? The Guardian program here is going very well. We've trained well over 100. They have exceeded our expectations. Our attrition rate is next to nothing, and the quality of the people that we have is good. We put a lot of effort into front-loading the process, into screening people out. Those who are are there are primarily people who have either law enforcement experience, military experience, corrections experience or private security experience. Have you learned anything from that experience that could be applied statewide? Yeah. Be selective in who you hire for these positions. Just because somebody wants to do it doesn't mean we should allow them to do it. Did you consider recommending anything in terms of guns? Whether that would be further restrictions on sales or an assault weapons ban … ? That hasn't come up before the commission. So to take a step back for a second, when Gov. Rick Scott asked you to chair this commission, I wonder what was your first reaction? Well, I was humbled by the opportunity. It's a tremendous responsibility and opportunity to make a difference and to get to the bottom of it. Figure out what happened, and find out where the strengths are, where the weaknesses are, where the opportunities are, and to move the needle so that we do a better job in protecting the school environment and the kids. So I welcome the opportunity and the challenge. Why do you think you were chosen for this job? I don't know. (Laughs.) I guess you've got to ask the governor that. How has this experience compared to your other work in law enforcement? I've been at this for a long time — I started 36 years ago. But this is probably one of the more challenging. It's a very aggressive timetable with a myriad of issues and just a voluminous — and I can't stress that enough — amount of information. The initial report is due to the governor and to the Legislature by Jan. 1, and we're doing in seven months what the commissions after prior incidents like Sandy Hook and Columbine took two and three years to do. And because of the charged environment still in Parkland and in South Florida. So I think you put all that together, and it ranks right up there with one of the toughest things that we've done. When you said that it's difficult because of the charged environment, can you tell me more about that? Understandably so — and probably rightfully so in some respects — the community down there is just looking for answers. The community wants to know the details of what happened and are looking to place responsibility. Unfortunately it takes time. People want the decision makers down there to act faster than they can, and they need facts. And we are just now giving them the facts. So I think they need need to be given the opportunity to act once they receive the facts. And they only received the facts from us within the last two weeks. The community would be best served by taking a breath slowing down and letting the process take its course. Has it been more difficult than you expected? There's no question — it's bad. The nature of it is hard on everybody. But we're professionals, and we've got a job to do, and we're going to do it. The commission had subpoenaed Scot Peterson, the former Stoneman Douglas school resource officer who hid rather than going into the the 1200 building when the shooting was taking place. He didn't show up for his appearance. Some members of the commission suggested holding him in contempt of court or taking some other legal action. Do you know what's going to be your next step in trying to get him to testify? No, we haven't decided yet. That's something we need to look at. The December meeting is not going to be about that — the December means going to be about the report, and we'll see where we go from there. The commission recently reviewed a lengthy, detailed presentation about what happened virtually every second after the shots were first fired at Stoneman Douglas. And there have already been some repercussions — a captain in the Broward sheriff's office resigned, and four employees at the high school were reassigned to other administrative jobs in the district. Do you see those actions as appropriate, given the evidence? I don't have any problems with the actions but you need to ask the decision makers about that. Our job is to provide the information, and their job is to review it and then make the decisions they feel are necessary to be made. But there's certainly a basis for the actions in the facts, in my opinion. Since you've reviewed all the evidence, what do you think the investigation shows about Superintendent Robert Runcie's level of responsibility for mistakes that were made? I don't have any comment on that. There's a lot of things that were done right. There's a lot of things that were done wrong. I think that's best addressed in greater detail when the commission issues its report. So do you have the same answer if I asked you that question about Broward County sheriff Scott Israel? Do you think there are more people who should be held personally accountable for their actions before Feb. 14 and on that day? Yeah. We are in the process of referring that information to Superintendent Runcie and Sheriff Israel for them to conduct the appropriate internal review. So I think there are additional people whose actions need to be reviewed. At the end of the day, it's also important that each of those people be treated fairly, which means they have an opportunity to respond to specific allegations. The report is due to the Legislature on Jan. 1. What do you see as the future of the commission after you finish that? Well, I can't stress that enough this is an interim report, and this is a report that is going to scratch the surface. So there's a lot more that needs to be done. I understand why the Legislature wanted a report by January, so that they had enough time to act before the legislative session starts in March. The commission, under the statute, is in existence until 2023. We'll get this report in, and then we'll start looking at some of the more complex issues that need in-depth discussion — and expanding on some that we're already going to report on. The sheriff leading the state commission investigating Florida's high school massacre says he now believes trained, volunteer teachers should have access to guns so they can stop shooters who get past other safeguards. Two Broward County leaders who have been criticized for their handling of the Feb. 14 shooting at a Parkland high school displayed a stark contrast in attitude as they were questioned on Thursday by a state investigative commission that includes parents of slain students. The FBI plans to hire more staff and implement technology upgrades to its public tipline after mishandling two warnings that confessed Parkland killer Nikolas Cruz might shoot up a school.